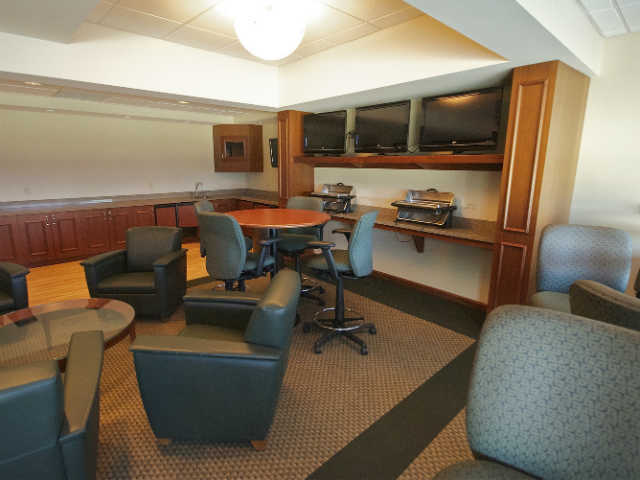 The Green Bay Packers Suites describes the most luxurious seating area at Lambeau Field. The Lambeau Field seating chart does not explicitly show the suites above all other seating along both sidelines. Green Bay Packers Suites fill three levels above the Upper Sideline on both sides of the field. The design of Lambeau Field ensures that even the highest level of suites offer a good view of the entire stadium. Since the Packers have only two tiers of seating below the Suite level, all of the individual Suites are close enough to the ground to offer a good view of the game. Most fans will choose a Lambeau Suite because of the luxurious amenities within the interior as well as the privacy that comes from a fully-enclosed space. Football fans should look at the Green Bay Packers seating chart and see more detailed information about the seating areas at Lambeau Field: Packers Suites, Packers Indoor Club Seats, Packers Outdoor Club Seats, Packers Champions Club, Packers Lower Sideline, Packers Lower Corner, Packers Lower End Zone, Packers Lower South End Zone, Packers Upper Level, Packers Middle South End Zone, and Packers Upper South End Zone. Packers Suites are sold either as full season packages or individual game packages. The team first offers suites to season ticket buyers. Any suites remaining at the conclusion of season ticket sales are then offered as individual game packages. Prices vary dramatically based on specific location, size, and length of contract term. Because of the high prices and large capacity of each Suite, few individual tickets will be available on the secondary ticket market.